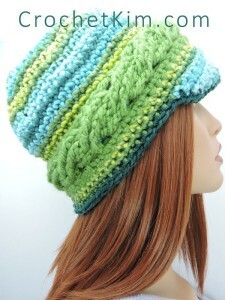 I love the cabled braids on this hat! It looks complicated, but Kim’s broken it all down to make it easy for just about anyone to master. The pattern recommends a bulky yarn and an L crochet hook. So it’ll work up quick too! If you enjoyed this free crochet pattern you might also enjoy more designs by Kim Guzman, owner of CrochetKim.